Sweet Cheeks Adventures: Trade in your MacBook with Gazelle! 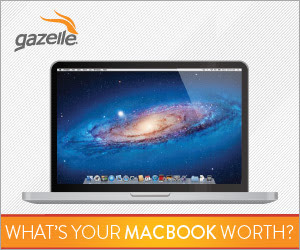 Trade in your MacBook with Gazelle! **FTC Disclosure Statement: This post contains affiliate links which means that I may receive a commission if you click a link and make a purchase. 45-Day Price Lock for MacBooks ends 3/20/2015. $20 Bonus Offer Terms and Conditions: One per customer and only applicable on MacBooks. Ends 3/22/2015.